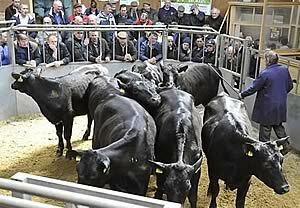 Cumberland & Dumfriesshire Farmers Mart PLC held their Fortnightly Sale of Store Cattle in Dumfries on Monday 10th June 2013. 141 Store Cattle forward – Trade looked sharper. More Grazing type forward. .
Angus to £1465 Barrasgate, £880 Smallrigg. The firm had forward a small show of dairy cattle, which were easily sold and more required to satisfy local trade. Quality fair, trade comparable to other outlets.